So on our latest Adventure to Home Depot, we had a little surprise... the Oscar Mayer Wienermobile!!!!! I had to yell at Alex, 'STOP, STOP, I want a picture of the WienerMobile!' I think I yelled so loud that people outside of our car heard me, haha! It definitely lightened the mood for us before running HD errands, anyway, the little things that make you smile! After we took the original planking off the upper level of our deck, Alex started putting the new boards down that we picked up on our huge Home Depot Adventure. Then... FINALLY! A real deck with normal spacing! So exciting! And here is Alex in process.... happy face!!!!! HAHA! But seriously, he is doing a great job getting the lower level completed. Maybe he is making that face because he has quarter sized blisters on his knees??? Could be! And adding the stairs between levels.... so far looking good! Next blog will be the finished product! Yep, that was a quote from Alex as he pulled on a brick that looked loose and then... CRUMBLE! 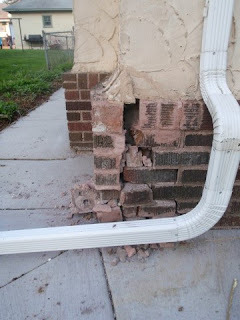 The whole corner just fell apart, we knew the corner was in rough shape when we bought the house, one of those things we should have written in the deal to be fixed, but since we asked for so much else we thought we could wait on this one. Turns out, when brick and mortar isn't looking good, best to do something about it right away because it is brittle stuff when space gets between it. Unfortunaletly for us, this happened when we were in our house for about a month, so we were already deep into our rennovating, and this was one type of repair Alex could not do. So we had to shell out money to get this fixed ASAP. The work was done very well, so we were happy with the result, it was a bummer it was expensive to fix, but it looks so nice now! Before we could start rebuilding the deck, we had to go to our favorite place in the whole world! You guessed it, the Home Depot! Alex and I have gone on many adventures at Home Depot, and I am sure there will be many, many more, so I will try to blog about the exciting trips- or I guess you can call it the trips that make you want to pull your hair out and have a mental breakdown. There's no better time to pull out a camera and capture the moment! So we needed to get wood to rebuild the top (existing frame) of the deck, and then build a new lower level deck. Here is one cart full of lumber- if you are wondering there are 36 boards on that cart. And the other cart, this one has 16 boards, two 4x4's, and other materials like deck nails, joint frames, and the stairs. Alex and I did this on a Saturday night, so HD was pretty empty and their staff was non existent! I pushed that cart from the lumber department to the registers in flip flops! It might not look hard, but the weight of the lumber was crazy! I can't believe I did it, then as we got to the registers two guys said, 'oh no one helped you with that' as they just stood there, nice job HD. Most of the time I find their staff to be pretty awesome, but not on a Saturday night! Now the fun part, we rented a Home Depot truck to bring the lumber home, thank goodness they helped us load it! The truck was $20 for 75 minutes, not a bad deal. I had to snap a photo of us in the HD truck, good times! We then unloaded the lumber and returned the truck, then it was time to get to work! 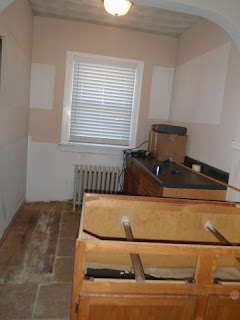 One thing we knew for sure when we picked our house, was that this kitchen nook made no sense and had to go! 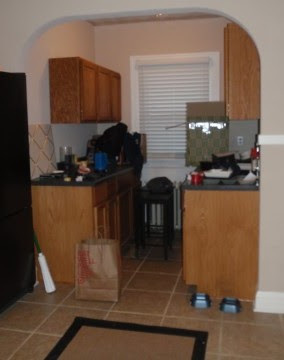 The cabinets lined along the walls on both side, so if you opened cupboard doors, they would hit each other, so when ever this was done, it was just a poor idea. What we both wondered was, what was the purpose of this space? Storage, eat-in area, or what??? 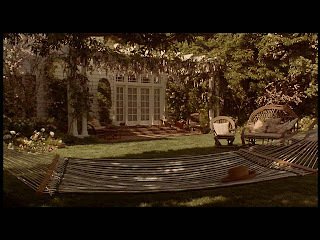 I did some research, and what I kept finding was something like the photo below, it was sort of like a booth, lots of Dutch Colonials built in the 1920's seemed to have this. 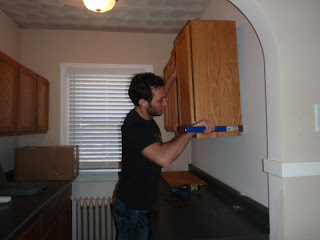 Basically, Alex started by unscrewing the screws that secured the cabinets to the walls. Then carefully pulled them away from the wall. And we finally ended up with a blank space! 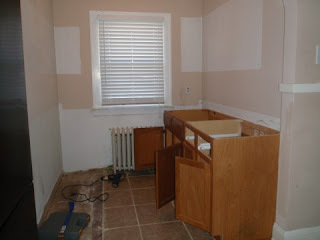 Just needed some paint, and of course, we needed to re-tile the floor since they tiled around the cabinets. So Alex had a lot of fun with that, using a tile cutter is a pain! Most of the tiles needed to be cut to fit the odd space. 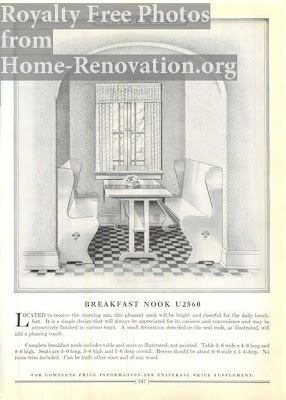 Oddly enough, now we want wood floors in the kitchen and nook, so who knows, we might redo this sometime. First, I hated the table in the middle of the nook, you couldn't move around it, so I needed to be able to put the table against the wall. Problem was the top of the table had space on either side so you could sit around it, and I just didn't like the cherry wood on the table top anyway. 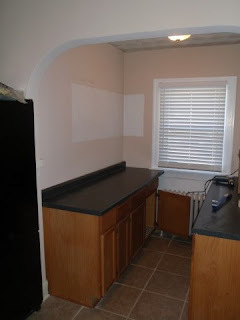 So I went to Ikea and bought a slab of butcher block countertop, which was an idea that I found on the Lettered Cottage Blog's Butcher Block Counter Swap. Funny thing, just like Layla and Kevin, Ikea didn't have the $40 countertop in stock, so I had to get the $80 one, darn Ikea! After picking that up, I removed the cherry wood countertop and attached the butcher block on top of the base. And wala! Instant new table that fit the space much better, and looked cuter! The butcher block slab cost about $80, and it was kind of a pain to unattach the original table top, but everything turned out great! So here is the nook currenly, we have a 'Wine Tasting' sign above the nook, and on the walls in the nook we have 2 framed wine label prints and then some framed historic pictures of the neighborhood I was able to print. We left another black stool to the left in the nook, but that might not stay, still trying to come up with a better idea for that side of the nook, open to suggestions if you have one! And I hope to add my antique window chalkboard to the space once it is complete! UPDATE: 10.29.10 This last photo is an update after finishing my antique chalkboard and sanding and painting the table! So much better than those crummy cabinets! In a previous post, I featured this framed copy of the original building card to our house which is at the bottom of our stairwell near our front entry shown below. Here is a close up of the building card (address blocked out). I contacted a librarian at the Hennepin Library in the Special Collections department, gave him our address and he came back the same day with our house history information and information about the first families that lived in our house. 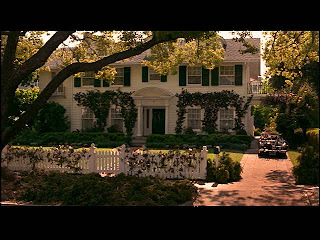 Our home was built for $5,500 in 1924 by Jake Freidson. Which is spelled incorrectly on the building card as 'Fredson'. How do I know that? Our librarian also sent us the US Census information about the families. Below is a copy of the Fifteen US Census from 1930. It is incredibly hard to read unless you zoom in like crazy, but the 2nd family listed from the bottom is the Freidson Family. Jacob and Anna and their three children were the first residents in our home. We got some help from the librarian about their life, they were a Jewish family from Russia and owned a grocery store at 2201 4th Ave. The second family that lived in our house was the Olesky family, here is the 1930 census information for them as well. Rymal and Sarah Olesky ran the Olesky Brothers Grocery with his brother Jacob Olesky at 801 9th Street South. They had three children and I can't really read it easily but also a live in Sister In Law or Mother in Law. This family was also Russian Jewish. I also have a post about the history of the Homewood neighborhood that details more about the families that lived there. Since North Minneapolis was historically Jewish, so it was fun to find out how our house fit into the history of the neighborhood. I hope to dig up more fun facts and details about our house and the neighborhood as we continue our little DIY adventure! 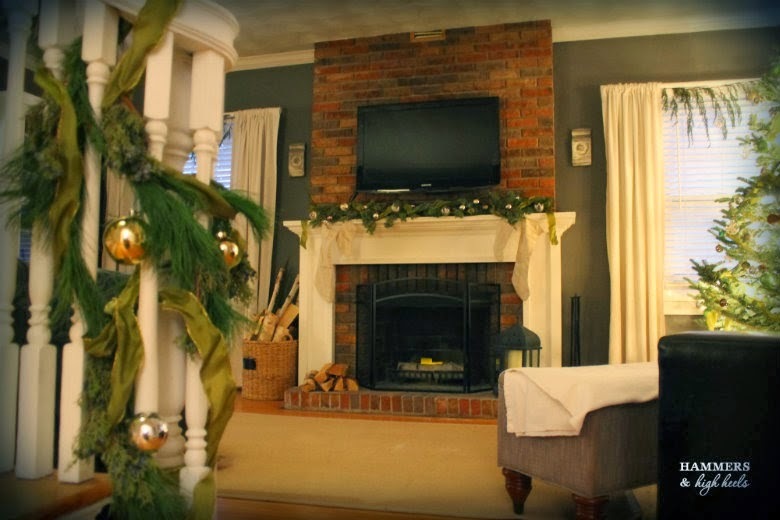 Since our fireplace was the main focal point of the living room, it made no sense to put our TV anywhere else, it would just make the room unbalanced. 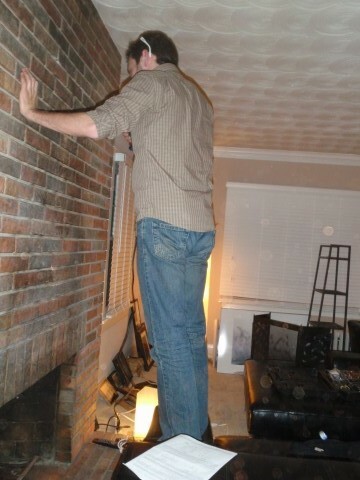 So we decided to mount our TV to the fireplace brick. All you will need is a wall mount for a flat screen TV and a brick drill bit. We found the mount at Target for $80 and the brick drill bit at Home Depot for $12. Once it was time for Alex to get drilling, we realized we didn't have any safety googles on hand. So, I grabbed the next best thing... my sassy BCBG shades! The drilling did take a lot of time and pressure, Alex had to throw a lot of weight into the brick to get the drill bit through, but it all worked out! I thought I should also update this post with a nicer photo! Here is what the TV looks like mounted today (during Christmas time I should note!). To start, get 1x2's, 1x3's, 1x4's, and begin to create a frame to stick the wood to. 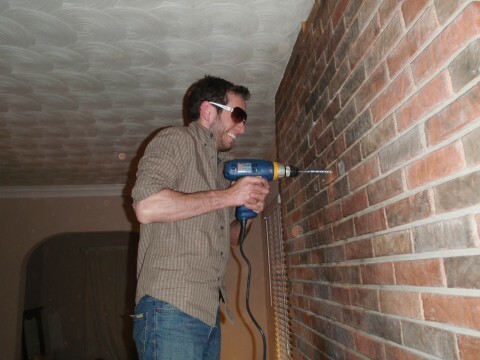 Alex used Loctite Power Grab construction grade adhesive to bind the wood to the brick. Then added 1x8's and 1x10's of pine as the face of the mantel. Note: pine chosen over plywood because it has a finished grade. Used the same adhesive and 1 and a 1/2 inch wood screws. We both picked out the trim for the top of the mantel. Alex nailed all of the trim in, taped off the mantel, and then started painting it to match all of our white trim. Wow, our house was so dirty and dusty with all the work going on, yuck! Here it is! 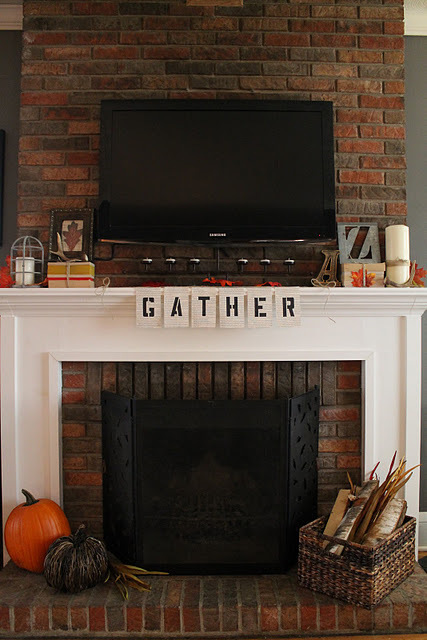 Our new mantel (with a newer less blurry photo)! It really made our living room more whole! Also, it helped to hide cords from the TV... SUPER BONUS!!! Alex routed the cords under the boards (he made 2 cut outs at top and bottom to route cords in and out of). I also love that I have a mantel for pictures and decor!!!! 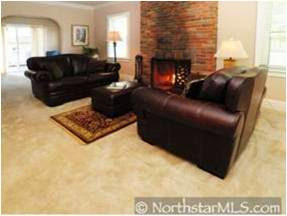 Here's a look at the orginal MLS listing photo of the living room. The carpet wasn't in very good condition and we knew underneath were beautiful hard wood floors waiting to come back to life! 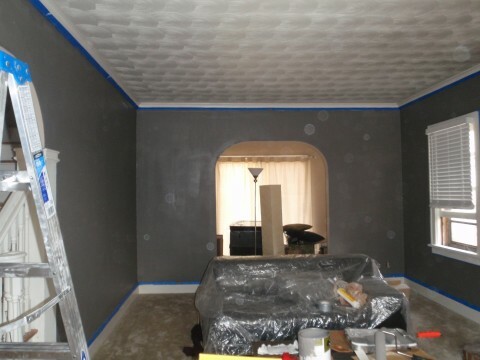 So, the first thing we did was paint the living room. No drop cloths needed since we knew the carpet was next to go! Then, we got to work on removing the carpet.... Rocco even helped! 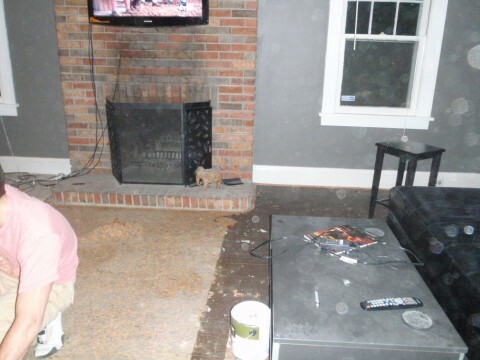 Here is a photo is process... to the right what you see IS the hard wood flooring, however during removal we found that it was painted dark brown at somepoint in time. Another fun surprise (sarcasm font). 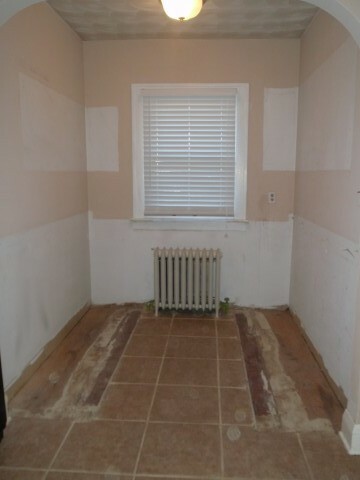 But at least we were going to sand and refinish anyway, just makes the before and after MORE dramatic! Here is a close up of the dark brown painted floor against our already finished floors by the staircase. I don't have pictures of Alex in process doing the floors (wa-wa, also this was all done before our blog existed). 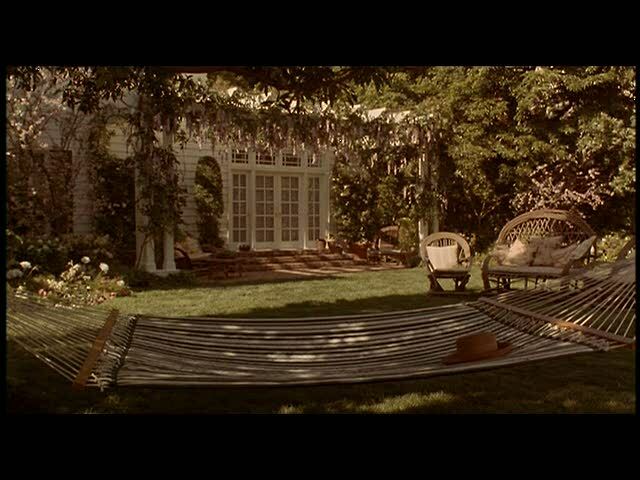 But during this time I was out of town for my wedding shower and bacholorette party in Michigan! My hubby is pretty amazing and sweet, I came back home to glorious, shiny, breathtaking, beautiful hardwood floors! Alex rented 180lb belt sander from Reddy Rents and took "5 minute belt sanding class". He purchased plenty of belt sandpaper to remove "deadly 40 year old lead based brown paint". Then he got to work sanding going length wise along the wood using 32, then 50, then 80, and then 100 grint sand paper going over the floor again and again to eventually to make the wood "smooth like a gymnasium floor". After getting the floor even and smooth, he primed it and removed loose dust with Mineral Spirits and a damp cloth. He did this at least twice to make sure the surface was completely clean and he made sure to open the windows or else he "would have gotten high". Next he had to apply the oil based or water based polyurethane (we used oil to match the rest of our flooring). To apply the polyurethane coat, he had to do 3 coats, 4 to 6 hours in between coats, then it had to set for 72 hours before any foot traffic or furniture can be placed. That's it!!! Love the new look! This project cost around $400 for us total. It will totally depend on the size of the room and the cost of water based polyurethane is twice as much per gallon than the oil based. Also, if you do this project on your own, it will likely cost a third or half the price of hiring a professional. It might take a whole weekend, but the floors will look amazing!